The South Downs National Park is the only Park to have a National Trail entirely within its boundary – the South Downs Way. It is one of 15 National Trails in England and Wales and was the first bridleway National Trail in England. 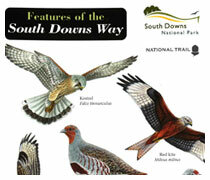 The South Downs Way has been a trail for thousands of years. Early man hunted on the chalk ridge, Iron Age tribes built great forts on its highest points and shepherds moved their vast flocks of sheep along the route. Today, this National Trail is still well travelled – but for pleasure. 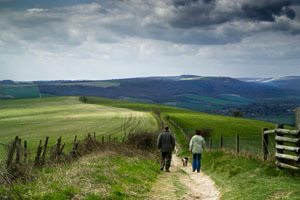 Stretching 160km from Eastbourne to Winchester, it is one of the best ways of exploring the South Downs National Park. The Trail can be enjoyed as one long distance journey or as a series of separate excursions and is fully open to walkers, cyclists and horse riders for its whole length. The South Downs Way gives you the opportunity to see some of the finest historical sites including the great iron age hill forts of Old Winchester Hill, Chanctonbury Ring or Devils Dyke. There are numerous ancient burial sites and cross dykes as well as more recent sites such as Uppark House or WWII defensive sites. 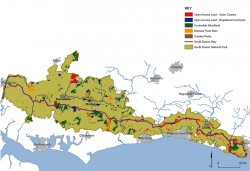 For nature lovers, the South Downs Way passes through an extraordinary range of diverse habitats from ancient woodlands, river valleys, chalk grassland to mixed farm land and coastal habitats. Fantastic opportunities exist for enjoying the areas special qualities through the South Downs Way and the wider rights of way network and areas of open access land, but there is no ‘right to roam’ in the rest of the National Park as most of this area is private land, managed by farmers and foresters.